Times’ online subscription sales jumped 46% in 2017 to $340 million. Digital ad sales rose 14% to $238 million. Facebook grew 47%. Google grew 23%. 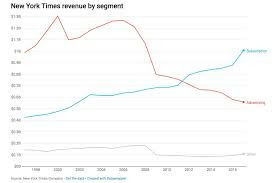 Since 2011, the Times’ digital subscription revenue rose 656% and digital ad revenue rose 168%, while print continued to get smaller. The big rise on the Times’ valuation is almost entirely sewn up in its digital growth. If the market is being smart, it’s really applying a startup valuation to the Times’ online business. But what’s particularly noteworthy is how quickly the business has grown. The paper brought in $340 million in online subscriptions for 2017, a 46 percent spike over the previous year. Even more impressive: that’s also the average annual growth rate since the paywall started in 2011. That equals Facebook, which grew its business 47 percent last year, and it’s much faster than Google, which grew at a 23 percent clip. The Times’ overall digital business, by the way, is growing by 30 percent, altogether faster than Google. Of course, those comparisons are a bit of a feint. Both businesses dwarf the Times. But it’s still apt since A) it is Facebook and Google that have been eating away the news business, and B) the Times, a 166-year-old establishment known for being stubbornly and decorously staid, often to the point of self-defeat, is now growing like a Silicon Valley behemoth. Wall Street noticed, sending the Times’ stock up today as much as 14 percent after the company released its quarterly earnings report. The paper as a whole is now worth $4 billion, which is good news for the Ochs-Sulzberger family that controls the Times, since it owns about 11 percent of its equity. The family appointed 37-year-old Arthur Gregg Sulzberger to take over as publisher at the start of this year, following in his father’s footsteps. Along with his cousins Sam Dolnick and David Perpich, the trio have firmly taken hold of the paper’s strategy. But let’s cut to the last page. The future of the Times — and of every news publisher — is digital, and the Times aims to create an $800 million digital business by 2020. You could argue it is being smartly ambitious by necessity. Last year, the Times’ online revenue grew 30 percent to $578 million — like we had predicted in November. When including the Times’ Wirecutter business, led by Perpich, the company booked $607 million in total digital sales for the year. That’s about 2.5 times what it was in 2011, which means there’s a very good chance it’ll hit $800 million soon, possibly before 2020. But would an $800 million business sustain the Times’ current newsroom of 1,300 journalists? That headcount hasn’t changed in years, to the Times’ credit, and it’s clear that supporting such a large newsroom requires the hefty revenues from print. The problem? As the chart shows, print is in inexorable decline. It dropped 3 percent last year and has fallen by 21 percent since 2011. And as a $988 million business, it’s easy to see why any executive would be seduced by its large size, despite diminishing by an achingly slow 4 percent a year on average. It would almost be easier if it had just fallen off a cliff. Instead, it’ll continue to drop by increments in a dangerously quiet deterioration. He adds that an $800 million business would support the current newsroom since the costs to a digital operation would be far lower. But there are nonetheless big costs to a digital operation. The Times’ growing native ads business, for example, requires a lot of custom work, effectively amounting to an in-house ad agency. The margins on a digital business altogether are also unclear. Infrastructure spending, as well as the need to continuously spend on r&d might not necessarily make it much more profitable than print. But no matter, a digital-only Times is only going to get bigger. So what, then, would a digital-only New York Times be worth? Let’s consider the value of digital-only publishers like Vice or BuzzFeed. Both have fallen short of ambitious revenue targets, but they’re still very highly valued. Vice is worth $5.7 billion by its investors, about eight times its revenue. BuzzFeed’s $1.7 billion valuation puts it at 5.5 times its sales. Of course, neither metric is ideal, but they’re a measure of how to look at other publishers. In that case, the Times’ digital-only business would be valued at between $3.4 billion and $4.9 billion. Again, these comparisons aren’t the best, but there’s some logical overlap. Both Vice and BuzzFeed are privately held businesses with a class of investors who have little to no say, along with a small group of super investors who have all or most of the say. The Times, while it’s a public company, operates very much like a private entity. It similarly has a class of investors who have little say and an elite class who have all the control. The Ochs-Sulzberger family always elects two-thirds of the board seats, despite owning just 11 percent of the equity. Altogether what this tells us is the big rise on the Times’ valuation is almost entirely sewn up in its digital growth. If the market is being smart, it’s really just applying a startup valuation to the Times’ online business. In other words, that $4 billion market value is wholly about digital sales — the print business isn’t being counted. So why not just cut the print altogether? 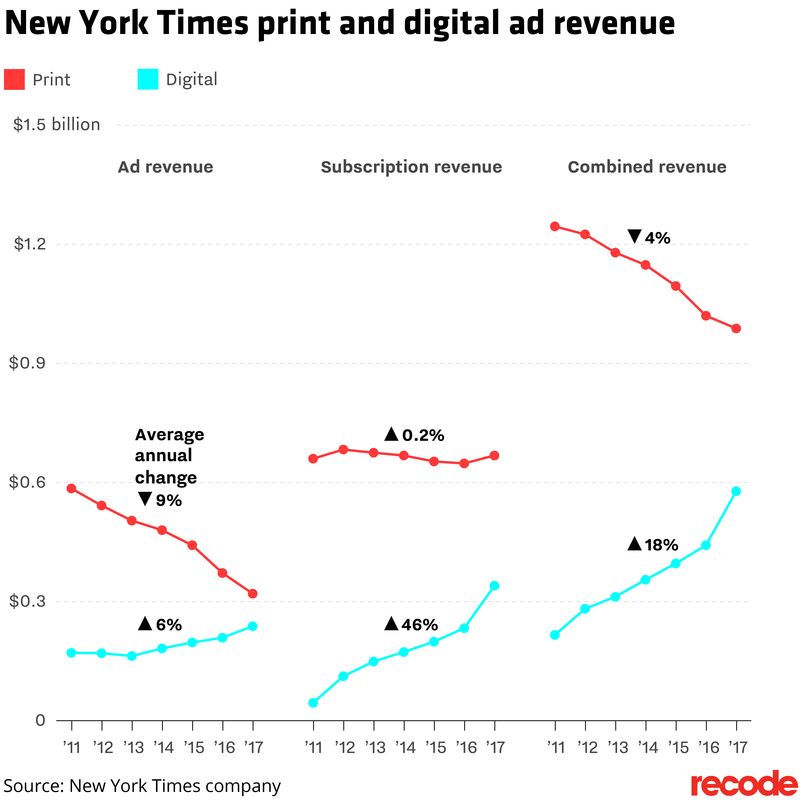 Yes, that’s a bit of a walk, but consider: Since 2011, the Times’ digital subscription revenue rose 656 percent and digital ad revenue rose 168 percent, while print continued to get smaller. Who wouldn’t prefer to just own the online balance sheet?